You are here: Home » Tropical Log » kingfish » Kingfish Season : Tampa Bay | Where is the King? 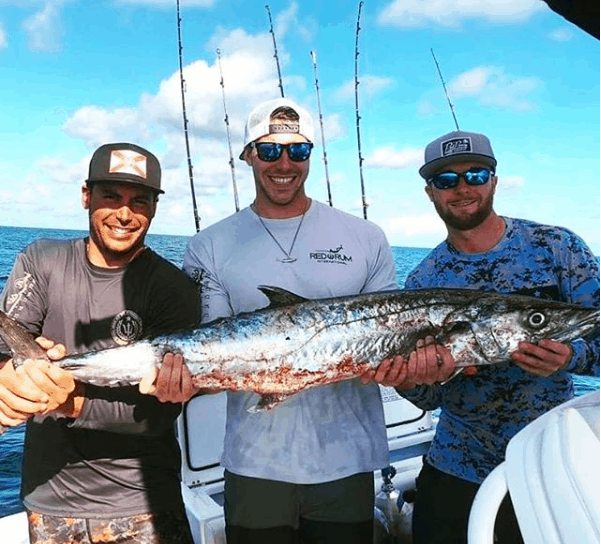 Kingfish Season : Tampa Bay | Where is the King? This is the time of year when King fishing on the beaches and nearshore reefs is incredible. One of the more popular methods is drifting or trolling live baits. Pilchards, Threadfin Herring, Menhaden, Blue Runners, or even Spanish Mackerel are commonly used baits that can be caught in our area. Kingfish are a member of the Pelagic family and unlike most of our inshore species, they are constantly moving. They are attracted to structure and are a sure bet to be around the scene of any feeding frenzy, particularly large bait schools. A good sign for locating Kingfish is finding their cousin, Spanish Mackerel. This holds true especially inside the bay. Once you have located an area to target, set out a few rigs and begin to work the area. As mentioned above, live baits are normally the bait of choice, but large spoons, feathers, skirts, and even lipped plugs will get the job done. While trolling, I like to start outside the target area or structure and work the area in a “zig-zag” pattern until we find the bite. Always keep an eye out for activity on the surface. Whether it be birds or fish, sometimes that is the difference maker. The Egmont Channel, stretching from the Port of Tampa inside Tampa Bay, all the way out to the Whistler Buoy, is a 20-plus mile artificial reef. The sheer walls of the channel, coupled with the FAD-like chains that secure its marker buoys, are a never-ending bait magnet. And where there is bait, there is kingfish. This is an interesting area southwest of Pass-A-Grille aptly named for it’s steep drop-offs. Twenty-foot roll-offs are common out here and the bait can get soupy around the structure. This one of those areas that can be fishless one day and turn on overnight and hold big fish for many days. A good area to fish when it gets a little rough. Between Boca Grande Pass and Anclote Key are countless patches of live bottom in 12 to 25 feet of water. Some of the areas are full of small ledges and breaks while others are as flat as a pancake. Most are interspersed with “kingfish highways” or roll-offs where the sand meets the rock in a defined edge. Slow-trolling big live baits like mullet, ladyfish, mackerel, trout and shad through these areas can be deadly. Anchoring on an edge and chumming can also be productive. There’s something about a wreck that can attract and hold a large number of big kingfish. Maybe it’s the smorgasbord of forage available (from sardines to snapper) or the simple security of high relief. In any case, the Blackthorn/Sheridan, Tug & Barge, 10 Fathom, Betty Rose, Clearwater Wreck, the Gunsmoke, the Shrimp Barge and the Mexican Pride are all well-known wrecks that have all produced big kings in the past. Slow-trolling over the structure as well as working circles away from the numbers can be deadly. Anchoring up-tide and employing a chum slick can be productive but can bring you un-wanted attention as well. Fishing a wreck and an artificial reef are about the same. The only difference is that most artificial reefs are scattered over a fairly large area. Knowing where each and every piece of structure is on a given reef can put you in front of kingfish that haven’t been worked by the pack. Spots like the Rube Allyn, the Indian Shores, the Tarpon Springs and all of the M reefs off Sarasota are unique but can be fished in similar styles. Map out the structure and work the water column hard with whatever bait is holding in the area.